Even a die-hard fan of Cary Grant will find him hard to admire here. I blame the screenwriters. The novel on which “Suspicion” was based is psychologically complex, and quite dark. The heroine of the book (played by Joan Fontaine in the picture) strongly suspects that her husband Johnny (Grant) is trying to kill her, but she’s so in love with him that she drinks the glass of milk he gives her, believing that it is poisoned. 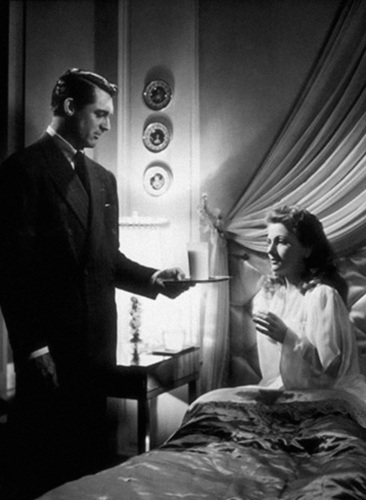 This scene occurs in the film, but Fontaine’s character leaves the milk untouched on her bedside table. You see her face as she contemplates drinking it; Fontaine does love Grant. Who wouldn’t, right? At moments, you believe that Johnny is truly as bad as Fontaine’s character fears. He seems to have no conscience, is quite manipulative, a pathological liar intent on his own pleasures. He takes advantage of his friend “Beaky” (played by the wonderful Nigel Bruce—imagine a slightly dissolute Watson, still thick but endearing as ever), embezzles from his cousin, threatens Fontaine more than once. But the evil you begin to perceive is always deflected and in the end you are supposed to think that Johnny is hopeless at managing his finances but at heart a decent sort who can be saved by the love of a good woman. Too bad, because watching Grant abandon his leading-man goodness and embrace a truly immoral role would have been interesting.